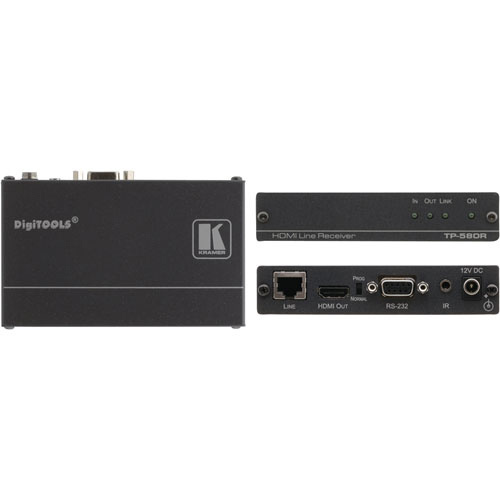 The TP−580R is a high−performance, HDBaseT twisted pair receiver for HDMI, bidirectional RS−232 and IR signals. The TP−580R receives an HDBaseT twisted pair signal from the TP−580T and converts it back into HDMI, RS−232 and IR signals. Bidirectional RS-232 & IR Interface. - Commands and data can flow in both directions via the RS−232 interface, allowing status requests and remote control of the destination unit. System Range - Up to 70m (230ft). Cable - For optimum range and performance using HDBaseT™, use Kramer's BC−HDKat6a cable. Note that the transmission range depends on the signal resolution, source and display used. Compact DigiTOOLS® - 3 units can be rack mounted side−by−side in a 1U rack space with the optional RK−3T universal rack adapter.